You may be craving a fun night out but don’t want to splurge at a super-expensive bar, especially if you haven’t received your year-end-bonuses. Thankfully, there is a way to have a great time without burning a hole in your pockets, and it’s hidden in plain sight! It’s time to go underground, at well, D’Underground, a bar and club situated in the basement of the International Building. Due its hidden location, it’s easily unnoticed by passersby who may be missing out on all its perks. You won’t have to pace yourself or worry about “drinking within a budget” because D’Underground is having free-flow booze every night from 6PM - 2.30AM on Tiger Beer and House Pours. Note: Pricings are tiered based on timing. For example, if you order at 6PM, you’ll enjoy free-flow till 9PM. If you order at at 8.30PM, you’ll enjoy free-flow till 9PM as well. *This is applicable only for Friday and Saturday nights. To get free flow beer and housepours, you will get a wristband that gives you access to the self-tap machine. Here, feel free to fill up your glasses as many times as you want, whenever you want. Or if you’re with friends, share the Beer Towers which are on promotion at $68 (U.P $98). 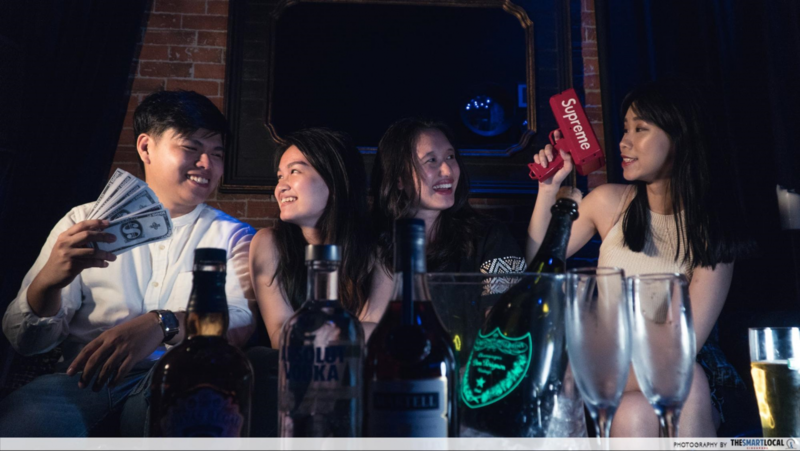 Take it up several notches and become a baller for the night by spending $800 on drinks - you’ll get LED lit glasses and even a cash gun so you can make it rain money like a Lil’ Wayne music video. Heck, bring it home if you want. 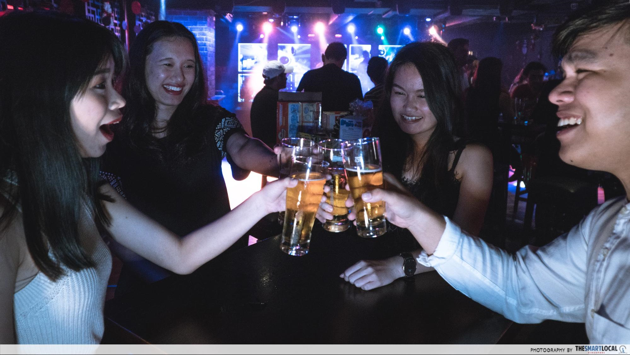 Some of us have friends who can’t decide if they want to chill out at a bar or rave at a club, so get the best of both worlds at D’Underground with its combined bar and club concept. There’s no need to pre-drink before hitting the club since you can do both in one place. From 6PM -12AM, the bar is relaxed and dimly-lit with mingling guests. The dance floor isn’t too crowded during this time either, so you and your squad can hoard it as long as you like and be the stars of the party! 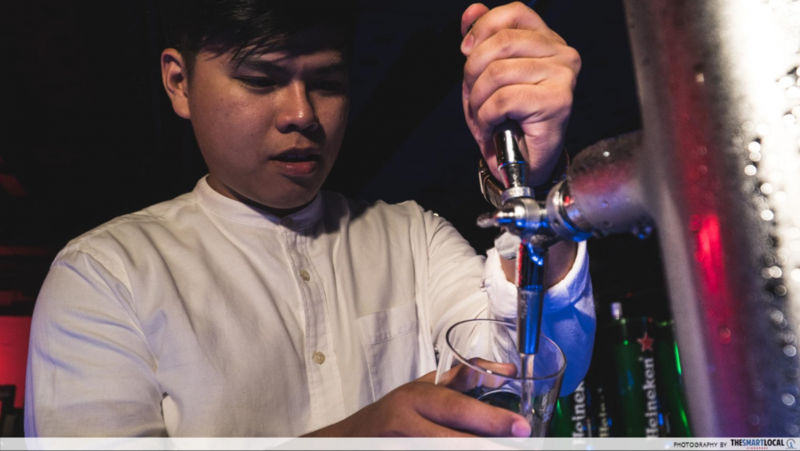 But if bobbing around isn’t your thing, try games like beer pong, or lounge around the high tables and groove to live performances from resident bands like Mix & Match and other guest performers. From top 40s to R&B and old school rock, their songs are bound to be your jam. If your aim is to headbang the night away, head down after midnight - this is when the club is really hyped up with pulsating beats, flashing LED screens and neon light beams! Guest DJs such as Thy Dowager, Gemstarr, DJ Kaylova and DJ Koflow have also graced these decks. 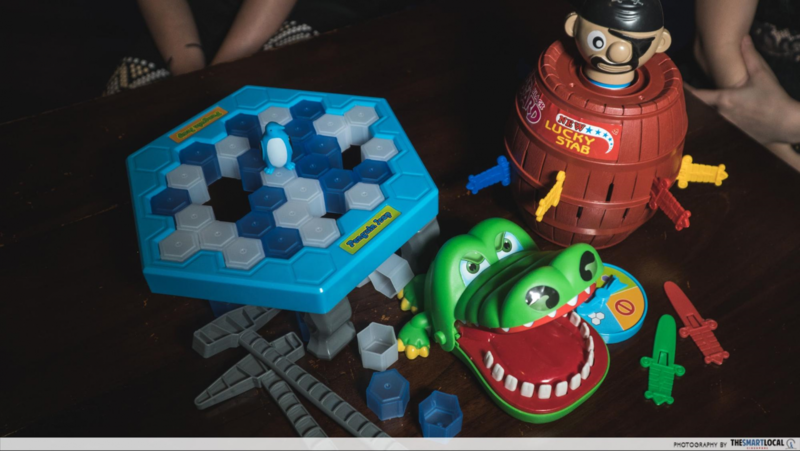 If beer pong is too basic for you, rev up the drinking game with a blast from the past - table games such as Crocodile Dentist, Penguin Trap and even Pirate Roulette, a game popularised by South Korean variety show Running Man. Thankfully, these games don’t require that much brain power - which is good especially after all the drinks. We especially loved the Crocodile Dentist since it got every adult at the table squealing when the jaw snapped down on our fingers! Psst.. We’ve heard nostalgia-inducing games such as 5 stones and pick-up sticks will soon be added to the line-up. So, best to get on dreaming up drinking punishments for the two. Partying requires a lot of energy, and the same goes for our phones. In fact, all the wefies with friends and IG stories documenting your fun night out may just be taking a toll on your phone battery. 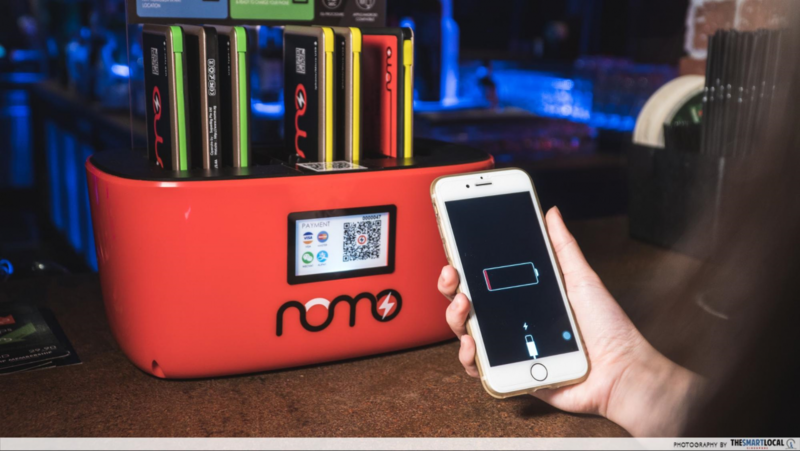 These NOMO power banks will save you from dead phone induced FOMO - and you can charge on the go at only $1! All you need to do is download “NOMO” on the App Store or Google Play, and link your card details for payment. 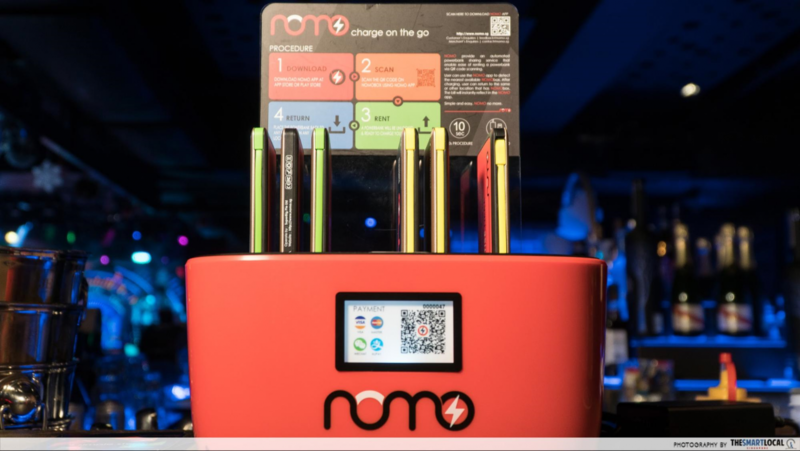 After scanning the QR code on the NOMO box, you’ll unlock a fully-charged power bank and cable. Reminder: Use it all night long - but don’t forget to return them to the Nomobox after use! Fans of The Connoisseur Concerto (TCC), rejoice! 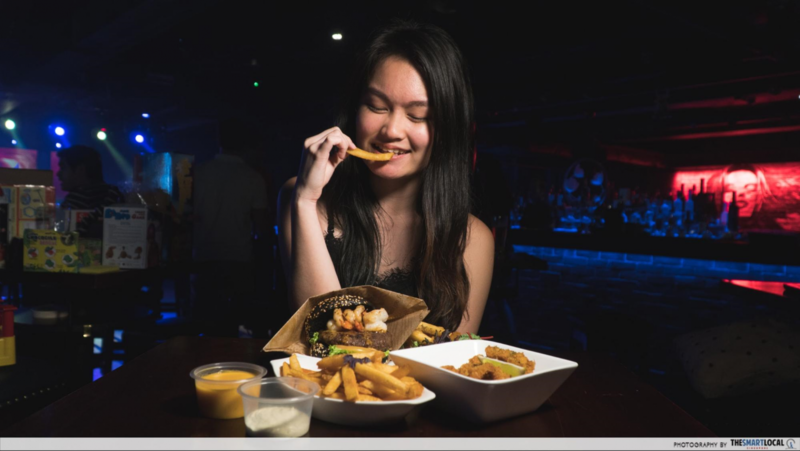 D’Underground has collaborated with TCC that’s located just above the club, so guests can enjoy delicious bites while partying - from 6pm all the way till closing time. Since charcoal food seems to be the trend these days, we tried TCC’s best seller - the Wagyu Beef Burger ($23.80). The toasted charcoal buns had a nice granular texture, holding together a juicy beef patty and other savoury fillings like tiger prawns, garlic shrimp floss, and citrus-truffle dressing. Mmmm. Other great picks for sharing: The U.S. Country Fries ($10.80) and Fried Calamari ($12.50)! 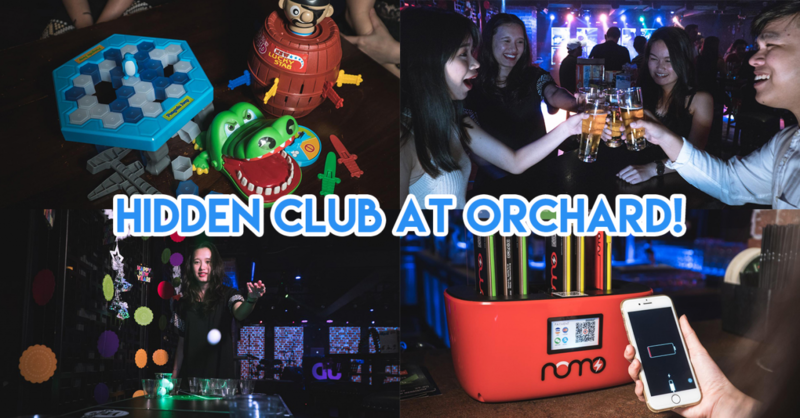 If you thought all bars and clubs at Orchard were pricey and run-of-the-mill, think again. 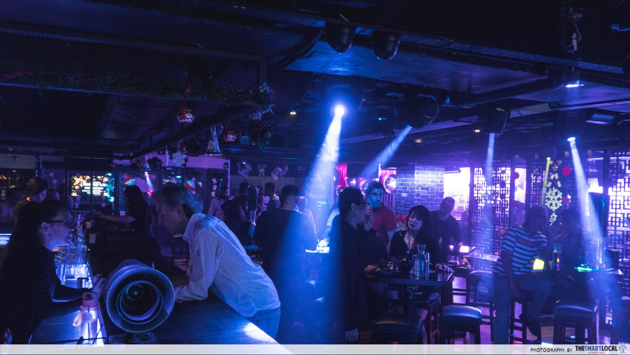 This hidden underground club will save you tons of cash - use them in the cash gun instead - with its affordable price and free flow drinks. 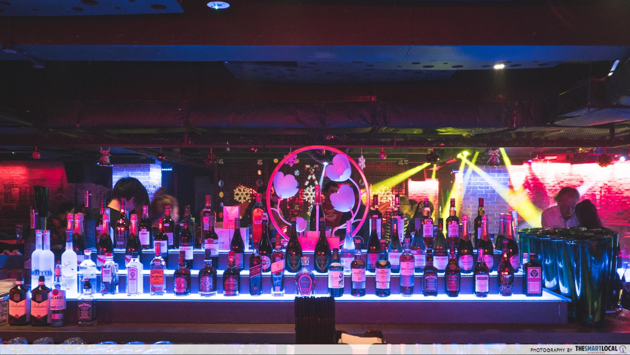 Along with cool table games that will zhng up your usual drinking games, it is possible to have the absolute clubbing experience without going to the red. Find out for yourself and bring along your clubbing kakis to D’Underground this weekend! 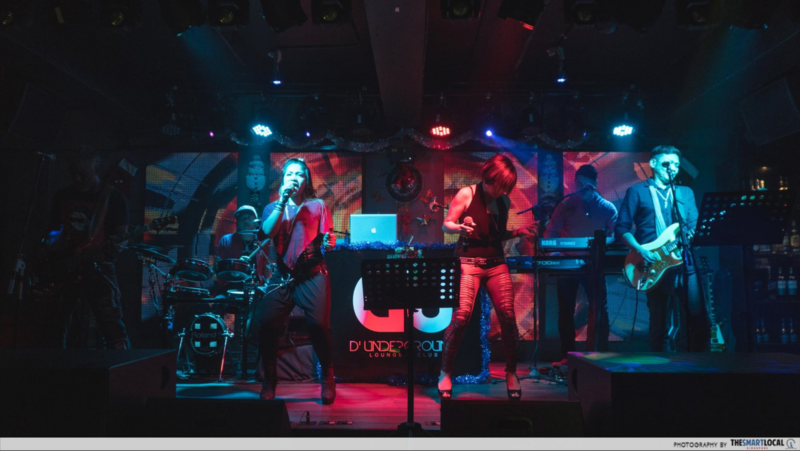 Find out more about D’Underground Bar & Club here! This post was brought to you by D’Underground Bar & Club.